As we near the end of the Fringe, host Gareth K Vile welcomes two guests whose plays have melded hot button social and political subjects of the day with humour, playfulness and a dash of punk. 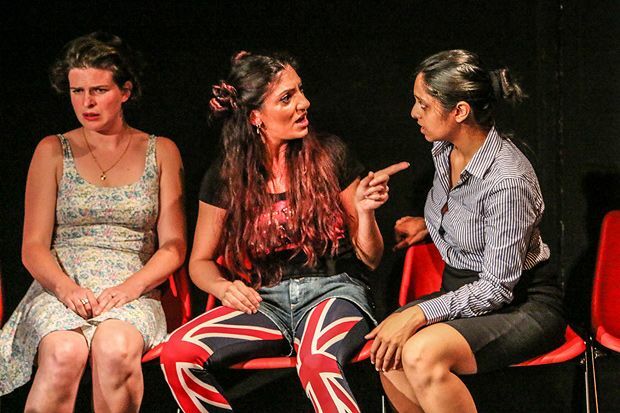 Writer Afsaneh Gray's satire, Octopus, tackles what it means to be British. Set in dystopia alt-world where three women prepare for the state to determine how Brit they really are, Octopus challenges false visions of a homogenous native culture. In part three, fellow dramaturg Dr Kasia Lech talks about her solo show Bubble Revolution, which confronts some of the challenges Poland and its' migrants have experienced transitioning from communist bloc to western state. And Gareth confronts his comedy shortcomings again as List comedy reviewer Murray Robertson shares his Fringe picks. At the Fringe is co-created by Gareth K Vile (host) and Annie Kolemen (producer). Equipment supplied by Subcity Radio. Post-Brexit satire exploring what it's like to be treated as a foreigner in your own country. The Empire Builders and Where Do All the Dead Pigeons Go?